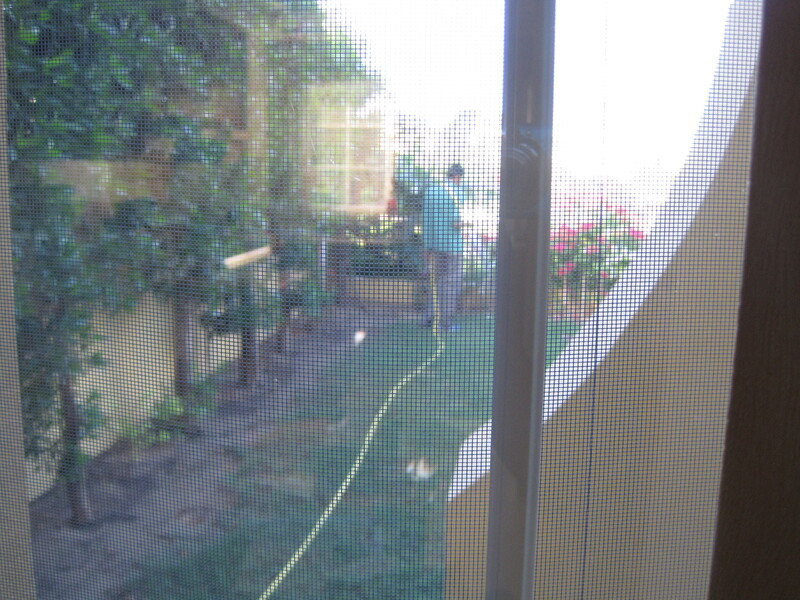 Here’s the guy that came with the house……..
he comes just about every day, as close as we can tell. 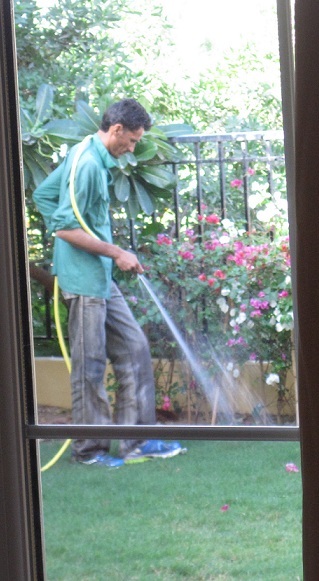 He sweeps the walks and steps, cleans up flower petals, branches or leaves that drop, keeps bushes in check, trims anything that needs trimming, waters everything and then rinses down the walks and porches and patios. I dunno who he is, he only interacts with Phil….. that’s just the way it is here. The first week he came, he paid a LOT of attention to the front entrance, steps, bushes….. the second week, he saw TBG and said “Back gate. No key”……. the back gate was locked, that’s why he hadn’t been doing anything back there. So, the situation is unlike anything I’ve ever experienced before,….. kind of odd, but he’s working. Steady, too. DAILY he comes…. Well, six days a week. December 2nd was National Day, sort of like the UAE Independence Day – it celebrates the union of the 7 Emirates. Talk about a blowout – holy smokes…. Fireworks like you can’t believe, everyone has their cars decorated up with stickers, magnets and wraps and the UAE flags are everywhere. Including the malls, restaurants, people’s clothing, cookies, cupcakes, newspapers, decorations up like it’s Mardi Gras – truly awesome display of patriotism…. Err…. Nationalism. And the Silly String is rampant – remind me to buy stock in the company that produces it next year BEFORE this celebration, there’s that much! 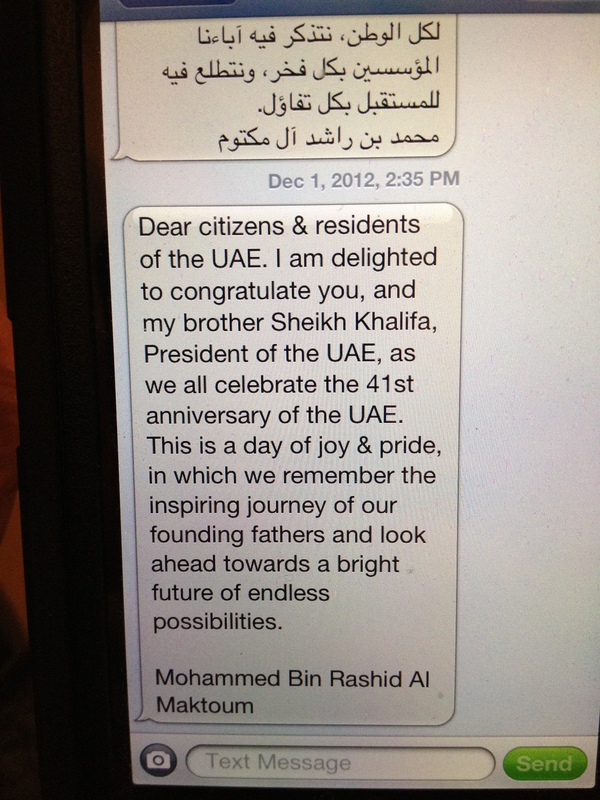 Oh, and TBG personally got a personal text message on his personal cell phone personally from the Prime Minister of the UAE, Sheik of Dubai, Mohammed Bin Rashid Al Maktoum. First in Arabic, which is a really pretty written language, but makes no sense to me. Of course, later, he got the translated version you see below. Pretty cool, huh? I didn’t know TBG had even met the Sheik, much less was on personal texting terms with him. I was totally impressed! <grin> Now he truly hasn’t met HH, but I thought that it was kind of comforting and spooky at the same time that the ruler of a country could/would have the ability to send you a text message to your personal cell phone. There are a lot of things here that impress me. Many others that confound me. Grocery shopping here is constant and can be quite annoying. There are no “one stop shopping” places…. No Wal-Mart, no Kroger, no Meijer. In order to get everything on your list, you may end up shopping at 4-5 different stores, located in 3 different malls. Driving about a total of 2 hours to get to/from all of them. And the strangest things are simply not available here, like Crystal Light drink mixes, to which we’re both totally addicted. So, that particular product deserved a chunk of space in my excess baggage, and will continue to do so on trips back and forth to the US. But I had a devil of a time finding dry mustard powder, and with ALL the spices available here, I found that odd. Finally found it in a “UK” section of one of the groceries. Now dried onion powder? I’m starting to think it may not be here. So, you just adapt to not having a specific item for now….lol. Since the malls here are multi floor, if you buy groceries on the 2nd floor, but you parked on the 3rd floor, no problem, there are escalators with no steps so you and your shopping cart go to the floor you parked on. But wait. There’s more! 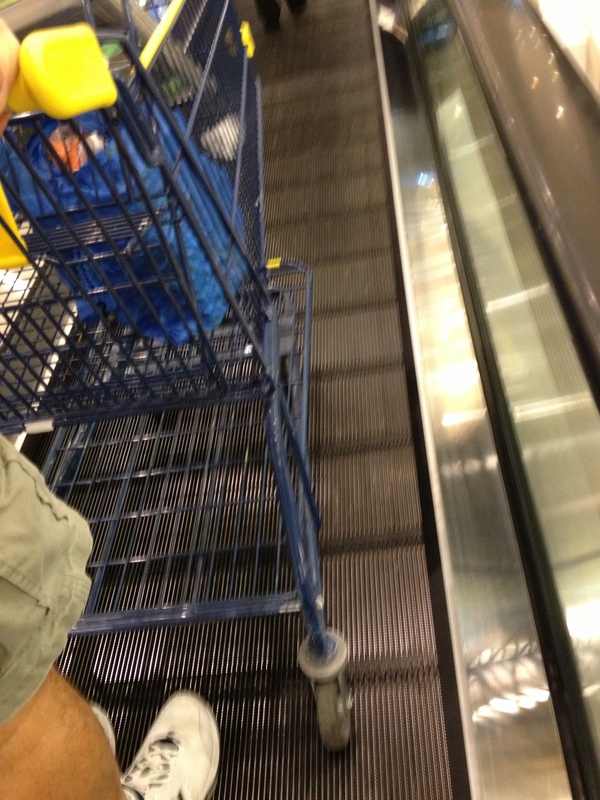 Can’t imagine holding that cart in place on a moving escalator, especially if it’s heavy and headed uphill, right? 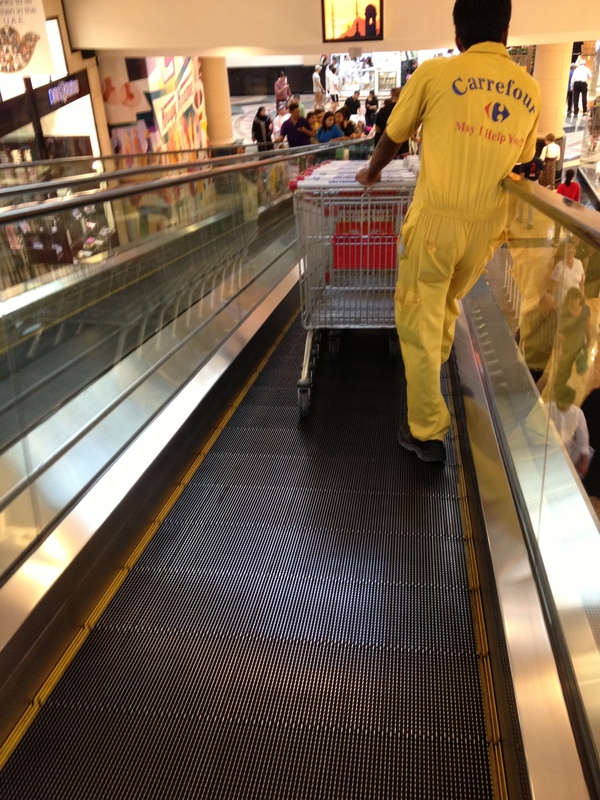 I thought TBG was superhuman or something….. turns out there’s some kind of magic force field that puts the brakes on the carts when all 4 wheels are on the escalator surface. I still don’t get it, but I’m sure glad it’s there! Some kind of weird shopping-cart mojo I suppose, Who the heck thought of that and have any of my readers encountered it anywhere else?? So very interesting. (the shopping that is). Would love to have a yard man—well have one, the hubby, but one where hubby could just sit and watch someone else do the work. LOL – Jeanie, Carl would love that, wouldn’t he? It’s amazing the attitude and level of service that these folks provide. It’s what they do, what they know, and some of them, what they love. Pretty interesting. I have been snapping some photos of odd things I’ve found while shopping,….. too funny. Love that yard man! LOL. The shopping trip sounds expensive. How much is gas and what do you drive?? I think expensive is kinda relative…… for example, fresh breads baked on site here are dirt cheap. But a jar of american-style peanut butter is about $6 US. Produce is a bit more, but not outrageously expensive. Gas is about $2 a gallon for “special” which is 95 octane…. super supreme. TBG has a Mitsubishi Pajero, which I’d never heard of. Here? There are a brazillion of them! http://sohbetna.com/auto_offer/pajero2006othercolor.jpg Maybe that link will work. Sounds like your having a great time there… Miss you! Loving the blog! LOL… yes, having a great time, and learning to adjust to the newness of it all. And trying to relate what I’m experiencing….. it won’t be just like what anyone else here is going through, because we all bring something different to the table, you know?